No, this is not an alarmist “the sky is falling” blog. Price reductions are a normal part of the selling process for many REALTORS and home owners. This is actually a blog about how those numbers are not included in our local Real Estate Statistics and how that affects our perception of what you should be able to get for your property. True story: I’ve heard for years from Florida brokers, agents and those who report on the real estate market that the average percentage of ‘list price to sold price’ in our market is 95% to 96%. Although this is possibly a true statement in one fashion, it is not actually addressing the question that most people want to know. The REAL question we want answered is… what is the percentage of ‘list price to sold price’ in our market using the ORIGINAL list price as the starting point. Unfortunately, I have not found a report to address THAT question. Instead, the math is being generated from the last price reduction prior to closing. 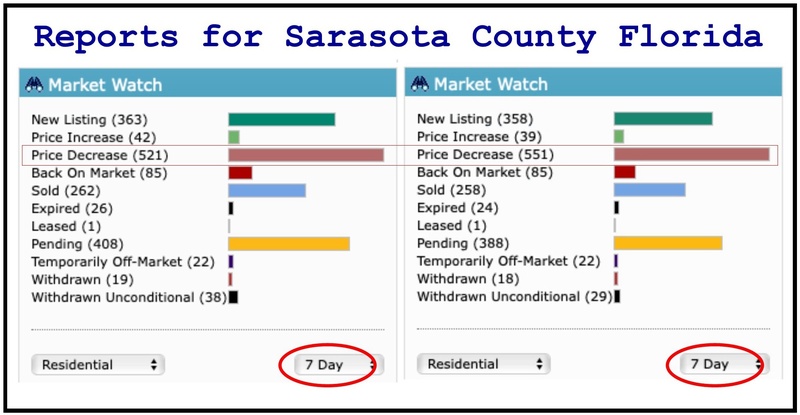 With over 500 price reductions occurring per week in Sarasota county, it is easy to imagine the profound effect this would have on the answer to that question. I just pulled up a listing that began at $474,500 and had several reductions until it landed at $415,000 and sold for $395,000. According to the MLS, this property sold at 95% of the list price. That’s quite a difference now, isn’t it? Can you see how applying 2000 price reductions in a month could have a profound impact on this statistic? Would you agree that having a good experience in life is often about proper expectations? If you are planning to sell your home and hope to get at least 95% of the asking price because that is what you believe most people are getting, you’ll be sorely disappointed if that does not occur. You’ll wonder, what’s wrong with my house? What did I do wrong? Did I choose a bad REALTOR? Is the market crashing? In reality, it may have been that you just did not use the correct process for determining what buyers are currently paying for what you have to offer. The reason I’m thinking so deeply about this issue today is that two very wise home owners interviewed me on Friday. They asked me the question “what is the average percentage of ‘list price to sold price’ of your listings?”. Since there is not a report to run for this, and the process for figuring it out manually is time-consuming, I did not know the answer. All I could do was to explain the basics of what I am now writing in this blog and get back with them the next day. Once I went through our teams last 50 listings and compared the original list price with the actual sold price, I was happy to learn that the answer to that question for The Steve Martin Homes Group was a true 96%. That did not surprise me though, since we go to great lengths to help our sellers understand what the market is doing and what they should be able to expect from the sale of their property. Once they see it with their own eyes, we are usually able to agree on a list price that is based on the market, not on their perceived value or personal hopes.